Soil compaction is defined as the method of mechanically increasing the density of soil. In construction it is important to establish a firm bedding upon which to build. 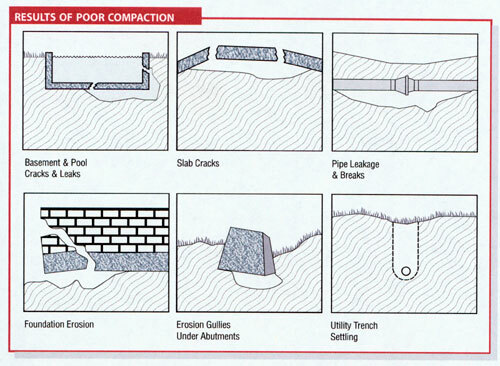 If soil compaction is not done properly settling will happen and damage to your structure will occur. 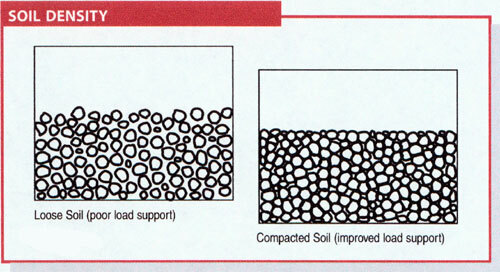 Uncompacted soil has poor load bearing capacity while compacted soil has greater capability of supporting a load. To understand how to achieve proper compaction we first need to know what "soil" is. Soil can vary greatly depending upon it's origin and moisture content. Soil is deposited by decaying plant life as well as by glaciers, rivers, wind, and lakes. Certain soils are good for building on and other soils are not. The key element is the ability to support a load and be stable throughout that structure's life cycle. Compaction of soil helps to achieve these goals by increasing the load bearing capacity, preventing further settling, and reducing water seepage and frost damage. If soil is not properly compacted any construction built upon that foundation will have problems. Organic soil is decomposed vegetation and is great for growing things but is totally unsuitable for compaction so we'll skip right over that type. Cohesive soils are dense and tightly bound together. They are very plastic when wet and can be molded but become very hard when dry. In order to compact cohesive soils it is critical that they contain an adequate amount of moisture. Cohesive soils usually require a force such as impact or pressure. Clay is a typical cohesive soil. The fine grains cannot be seen by the naked eye and are rock hard when dry and very hard to crumble in your hand. Granular soils are loosely bound and water moisture drains out of it quite nicely, unlike cohesive soils. Granular soils can be compacted either wet or dry with equal results. Granular soils, such as sand or gravel, make excellent bases for building on. The coarser grains feel gritty when rubbed between your fingers and have little or no cohesive strength when dry. Soil sample will crumble easily. Moisture content of the soil is critical for proper compaction. Moisture acts as a lubricant within soil, sliding the particles together. Too little moisture means inadequate compaction because the particles can't move past each other to achieve density. Too much moisture leaves water-filled voids and weakens the load-bearing ability. In order to verify that your soil is ready for compaction it is essential to test the soil to see if it is ready for compaction. There are many ways to do this. Electronic soil density meters are available for professional results as well as nuclear density testers, Proctor tests, etc. But by far the easiest and most simplest way to do this is with a simple "hand test". This test will give you basic information about soil moisture content without any special tools. 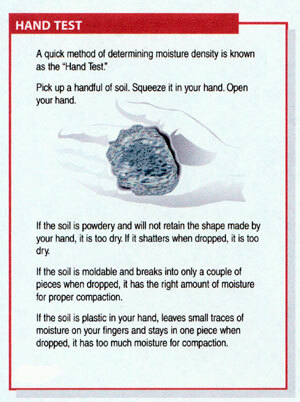 By molding the soil in your hand and dropping it you can verify whether or not it has the right moisture content. The type of compaction equipment used depends upon which type of soil you are compacting - cohesive or granular. Cohesive soils have particles that stick together. Clay is a good example of a cohesive soil. Therefore, a machine with a high impact force is required to ram the soil to force out the air and rearrange the particles. A vertical rammer is the best choice for this application. Larger jobs can benefit from a pad-foot vibratory roller if high production is needed. Granular soils do not require a high impact to free up and shear the particles, unlike cohesive soils. Sand and gravel are typical examples of granular soils. Vibration provides the best mode of compaction for granular soils and this is best achieved by vibratory plate compactors. Before filling in the hole with fill you need to understand the limits of each machine. You can't just dump 4' of fill into a hole and expect to compact it later on. 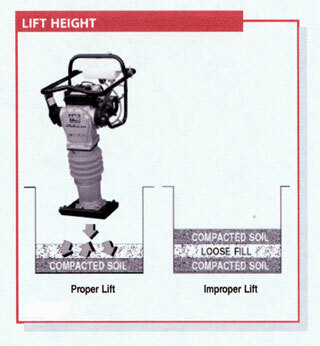 The amount of fill that you can safely put in at one time before compacting is referred to as a "lift". If you exceed the lift height you won't achieve proper compaction and the soil will settle later on. Kind of like a sandwich with the middle being soft and the top and bottom being firm. Vibratory plate compactors work best when operating on an "echo" principle. As the vibration waves travel down through the loose soil it is reflected back up once it hits a hard surface. If the lift is excessive, there won't be an echo and compaction will suffer. For this reason best results with a vibratory plate compactor are achieved when the lifts are between 4 to 6" maximum. Depending upon the soil moisture content it may be necessary to make multiple passes over the work area. Vertical rammers have a great capacity for lifts. Because they operate by beating the soil into submission there is no need for a vibratory echo return so this, combined with the greater impact power of a rammer means they can reach down farther. Typical rental rammers operate best between 6 to 12" of lift, depending upon soil moisture conditions. If the soil is drier the rammer may still compact at 12" but the machine will bog down in the deeper fill and it will be hard to achieve decent forward motion without wrestling the machine so you may find that shallower but more frequent lifts work better in that situation.